WindWishes are small paper banners strung with beautiful ribbons & beads, then hand-lettered with words that express your most heartfelt hopes and wishes. Use them inside or outside when you are celebrating life’s extraordinary moments. They can be used at your wedding for seating, a wishing tree, your vows, at the cake table, wedding favors and so much more. Below is just a small sample of many of the designs. They also you to get creative with their friendly “Design-it-yourself “ tools. In my life I have been a daughter, a bride, a mother, a calligrapher, a great grandmother and a cancer survivor... Through it all I have never stopped writing WindWishes, distilling life’s joys and sorrows down into their essence. 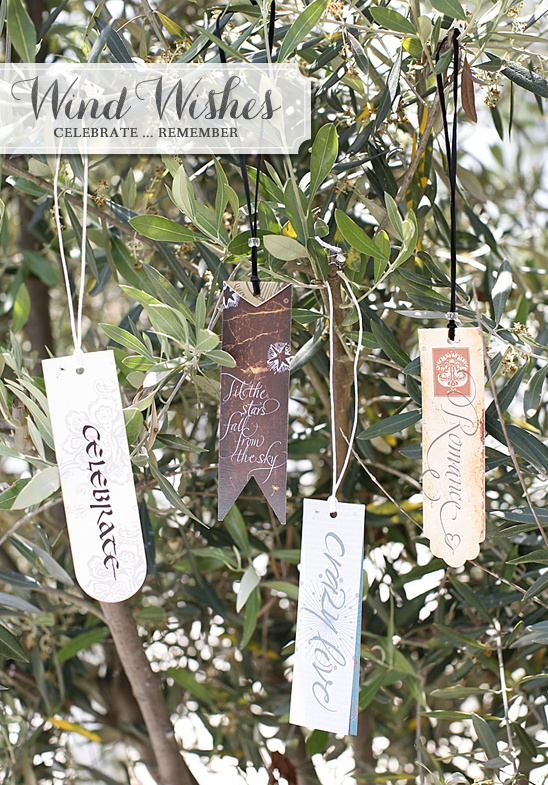 Whether you choose one of my designs or make your own, I hope these simple, beautiful banners help to create celebrations and memories you will never forget! Visit WindWishes to learn more about these keepsake pieces of art.